Whether you are filming using a tripod or a tree arm, a remote control is the one product that I can't film without! They attach to the handle of your fluid head and allow you to control various functions of the camera without touching it. This is valuable in hunting situations where it is important to be still and not make a lot of noise. Campbell Cameras has various remotes that connect to the camera's LANC port or the AV-R Remote port in some Sonys. My personal favorite is the Varizoom VZ-Rock Variable Rocker for LANC cameras. The reason I am partial to this remote is the location of the pressure-sensitive side-to-side rocker below all the other control options. That way my thumb doesn't accidently slip and turn the camera off or change control. This remote controls zoom, focus, and record. It features a data button to provide on screen info and you can review taped footage with the F+ and F buttons. For entertainment purposes, it is important to capture as many angles of the hunt as possible. As a member of the Solo Hunter Pro Staff and an avid Solo Hunter, I can't hall in 2-4 full-size cameras and operate them at the same time. I rely on the quality shots that the POV cameras can capture. They don't weigh down my pack or take up a lot of room, yet they capture Full 1080 HD. I use a variety of POV: GoPro, Contour, Muvi Gumball Edition, and the Replay. Because of its shape, I usually mount the Contour+ or the Replay XD 1080 to my bow to capture both angles (facing me and outwards). I will mount the GoPro or the MUVI Gumball Edition on a Gorillapod and wrap it around a limb above me in the tree stand to capture the angle of me shooting my bow/ operating the main camera. When I blowfish I mount the GoPro to the 10' Rode Boom Pole to capture the underwater shots reeling in the catch or boom shots above. 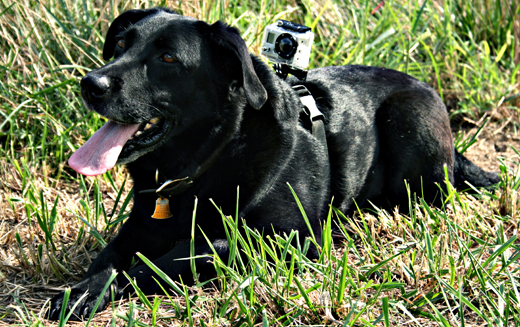 Take the GoPro and the GoPro Chest Mount and attach it to your bird dog to get the video of him retrieving (even jumping in the water!). The new GoPro HD Hero2 just came out and they allow you to attach a microphone to pick up better quality audio. In a couple of weeks (turkey season) I will be able to mount an external microphone to the GoPro HD Hero2 and mount that on a Gorillapod to place out by the Turkey decoys. Crisp, clean audio is very important to my final project, and a main focus while filming. To insure that the audio my external microphone are picking up is they way that I want it to sound, I always have my Audio Technica Pro Stereo Headphones on. They allow me to block out some of the outside noise, so that I can focus on the audio being recorded. This allows me to monitor the audio levels and adjust as I'm filming. This cuts down on a lot of post-production voice-overs and saves time! Not to mention they are great headphones to use while traveling to watch my recordings or listen to audio on my iPod. They are only a $60 accessory that in my opinion are a MUST! Bo Adams- A good-looking hunting partner or good lighting! I can't film without a good-looking partner right beside me. Usually I don't have a girl and get stuck with Jeremy! A Bescor LED Light is important to try and capture Jeremy in his best light. All jokes aside, lighting equipment has a large impact on the quality of film that you record. LED lights will give the most natural looking white light. The Bescor LED lights are dimmable and I use them both for filming in-the-field during the day and while on recovery shots. Using an LED light for during the day shots allows me to reduce the shadows around the subject's eyes when he/she is wearing a hat. During the recovery shot I dim the light all the way up and the Bescor LED 70 provides a light that travels about 30ft. When filming with my Sony HDR-AX2000 or similar camera, I mount the JRod in the shotgun microphone holder and then use the shock mount thats included with the Axden SGM-1000 to mount that microphone on one of the available shoes of the JRod. This is a professional 12.2" supercardiod shotgun mic. To insure that the microphone is not being recorded in the shot, I use the JRod to move the microphone back. This shogun microphone provides me with professional, crisp audio. It picks up a wide frequency range and you can't be the price! With it being a long mic, I do not recommend this for the smaller XLR cameras (Canon XA10). Wether you are filming on a tree arm or a tripod, a fluid head is required to get fluid movement out of your camera. The fluid head allows the camera to move smoothly when panning left to right or up and down. Fluid heads all depend on the size of the payload that you place upon them. 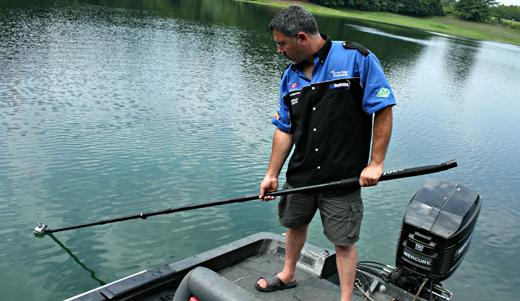 The Manfrotto 701 HDV Fluid head can hold up to 8.82lbs. The Manfrotto 501 HDV Fluid head can support up to 13.2 lbs. Determine the weight of your camera set up and choose the right fluid head for you! They are interchangeable and you can use them on a Tree Arm and also on a Tripod. Item Reviewed: Products You Can't Film Without 9 out of 10 based on 10 ratings. 9 user reviews. Wow, you are all spot on with your selections. Every one of those are vital pieces to the puzzle of churning out quality footage. I know I am not known for having the best video or audio quality but uniqueness of shots is a something that I feel that I can claim. Like Jeremy commented above, the smaller POV cameras provide a person the ability to capture angles and movements that are impossible to get with any conventional cameras. I would say the number one piece that I am super attached to as of late is a boom pole for my GoPro Hero 2. With a few simple filming techniques and some premeditated creativity a person can create some very compelling visual scenes with their RAW footage.